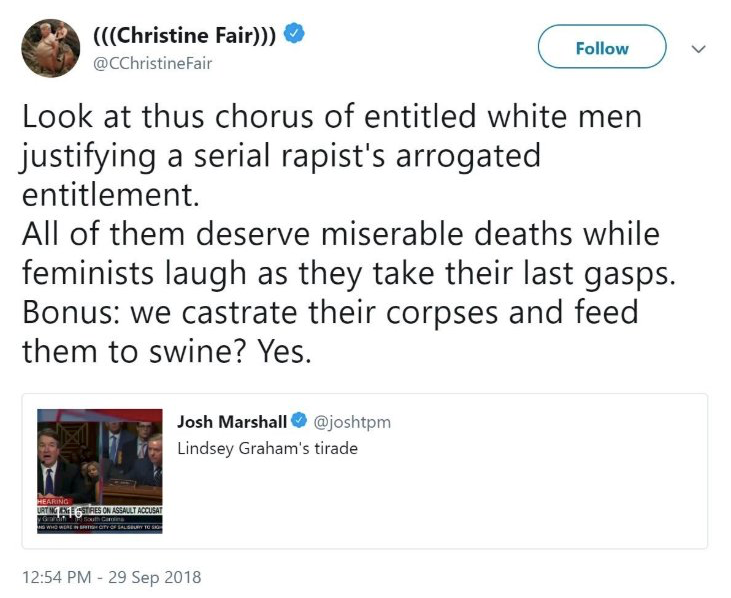 Twitter has removed Georgetown professor C. Christine Fair’s account after she tweeted that white men should be castrated and fed to pigs. “Bonus: we castrate their corpses and feed them to swine? Yes,” she added. The Intercept’s Glenn Greenwald noted on Tuesday that Fair’s account had either been suspended or permanently banned from the platform, presumably because of the aforementioned tweet. Georgetown University defended Fair in a statement Monday, asserting her right to free speech but adding that the university expects her not to be biased in the classroom.